Bought some nice photos of Omagh from a private collector £2 each - this shows how important the station was and should still be today, beautiful isn't it? Photograph taken from a BUT power car. What is of interest is the porter(?) running back down the platform away from the front of the train appears to be holding a GNR type train staff. If it was the staff for the Newtownstewart-Omagh North section, where is he taking it? To the Omagh North cabin? Which begs the question as why the staff was not surrendered as the train passed the North Cabin. Perhaps it was something that was not feasible for the driver of a railcar to do? Signalman too busy setting up the road for a down train? It might be a case of why attempt to exchange large ETS with the train on the move, if you can do it with the train stopped and have a few words with the train crew? It looks like a signal man would have had to stand beside the running line at track level to exchange a staff at the North Cabin and potentially risk serious injury, so far safer to exchange the staff on the platform and speak to another person. 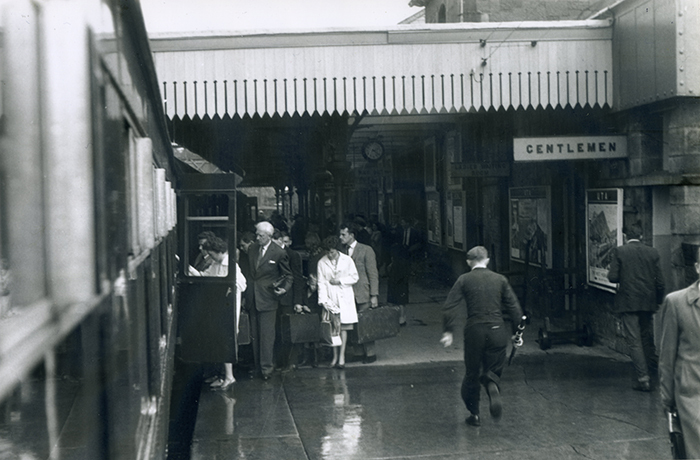 CIE sometimes provided a small platform at the cabin where a manual staff exchange could not take place at a station platform. Interesting to see a large ETS staff in use on a busy main line at such a late date. The above comments (especially Mayner's) are more worthy of consideration than mine. My comment about the signalman being busy setting the road for a down train was rubbish! He surely could not "set the road" for a down rain UNTIL he had the staff for the section north of Omagh. In steam days a signalman could stand at track level and presumably safely take a large GNR staff from the fireman leaning down off the footplate, whereas with a Railcar - no fireman - the driver could not lean out of his cab to deliver the staff at a safer lower level. Therefore I for one would accept Mayner's suggestion as the most likely reason the porter is assisting with the staff exchange. 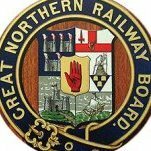 Presumably he had earlier been to the South cabin and obtained a staff for the next section to Beragh which he swapped with the train driver. Large ETS was in use throughout the GNRI, from introduction of block working to (mostly) line closure. But then, they didn't have such a need for replacement new instruments in the early 1920's, because nasty people decided to burn their cabins down (though there was a bit of that). Nor did they have as much singling later. And they seem to have been poorer than the GSR in the 1930's, so less inclined to spend if they didn't have to.